Juice Robinson joined Ian Riccaboni and Colt Cabana at the announce table. Williams was sporting a shoulder brace. The match had a fast-paced open, but Williams got the best of it and took over on Finlay. Ironically, he started working the shoulder of Finlay. Eventually, Finlay fired back and landed a leaping European uppercut out of the corner. After the break, Williams landed a single-arm DDT from the top turnbuckle. He then connected with a lariat that turned Finlay inside out. Both made it to their feet and a stiff striking exchange occurred until Finlay landed a backbreaker. It looked like it was all over for Williams, but he countered a suplex into an armlock. Williams then used a Death Valley Driver -- but Finlay kicked out. Finally, he landed a piledriver on Finlay to get the pin. Bandido had a counter for everything Haskins threw at him early. At one point, Bandido ducked a kick and landed in a headstand. 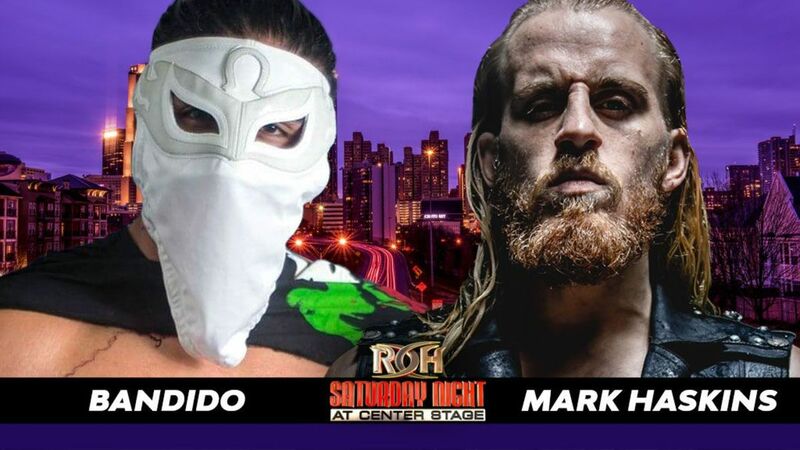 Bandido took a tumble to the outside, which allowed Haskins to connect with a dive. After the break, Bandido took control by launching himself to the floor with a Fosbury flop. Bandido used a pop-up cutter on Haskins but only earned a two count. Haskins used a rolling leg hook to pick up Bandido and hit a Falcon Arrow but also only got two. Both men made it to their feet, ran at each other, and each landed a running boot. A striking exchange ended with Haskins gaining the edge with strong forearms, but he ran into a huge knee from Bandido. Haskins got out of the way of a moonsault and was able to roll through into a Sharpshooter attempt. He used a double stomp from the top and secured an armlock -- but Bandido fought out. Bandido then caught Haskins with an incredible running, flipping, German suplex that earned him the win. Young was a step ahead of Isom early and often. He used his savvy veteran experience to keep the young man at bay with a facebuster suplex. Inevitably, Young’s arrogance got the better of him as Isom was able to launch the bigger man. Young fought back and laid waste to Isom with a slap to the face. Isom fired up and landed an Emerald Fusion driver but was only able to keep Young down for two. Young moved out of the way of an Isom dive and Isom splatted on the floor. Young connected with his version of the Arabian press moonsault. Young landed a superplex, but Isom kicked out at only one. Isom screamed that he wanted more. He nearly had the match won with a backslide, but Young hit a knee and landed his Misery finisher for the three count. Young is now the number one contender to the ROH Television Championship. After the match, Young got on the microphone and called out Jeff Cobb for never winning at the Olympics. He said Cobb was a disappointment. Cobb had heard enough and came out. Cobb got in the face of Young. Shane Taylor came from behind to jump him. Cobb picked him up and looked for the Tour of the Islands, but Young hit Cobb with a low blow. That allowed Taylor to pick up Cobb and nail him with Greetings from the 216.